With the success of Astley‘s, a former artiste, Charles Hughes, in partnership with Charles Dibden, the songwriter, on 14 November 1782 opened a rival theatre in Blackfriars Road at St.George’s Circus. It cost £15,000, and was named “The Royal Circus and Equestrian Philharmonic Academy”. This large building contained a stage for burlettas, as well as an arena for equestrian displays – a similar mixture to Astley’s. Dibden intended the entertainment to finish with a medieval joust. Children were the first performers since it hoped to prove the breeding ground for future stars. It is of interest to note that on the opening night playbill, horse patrols were employed to protect the clientele as they came and left the theatre. There was open rivalry between the Circus and Astley’s, with memorable publicity stunts. Both theatres put on a pantomime, but since neither had an appropriate licence, both managers landed up in prison in 1783 and the theatres closed, causing riots. The Riot Act had to read from the stage. Hughes did not have Astley’s genius and he fell into debt. The circus went downhill, but things improved when Delphini became manager in 1788. He was a famous buffo and produced some spectacular shows, amongst which was a “real stag hunt”. Dog acts were introduced, including a pair called Gelert and Victor. These daily attracted hundreds of admirers wanting to look at and fondle the animals. The theatre was burnt down in 1799 but was opened again the following year. Another fire occurred on 12 August 1805, and again it was rebuilt. The architect was Rudolph Cabanel Jnr and the builder was a Mr Donaldson, whose foreman, Thomas Cubitt, was just starting in the trade. In 1809 the auditorium was reconstructed and the following year the arena and stables were abolished. Having relinquished the equestrian presentations, it became known as the Royal Surrey Theatre. After a lean period, Robert Elliston endeavoured to raise the standard by presenting Shakespearean plays. But real success came when he produced Douglas Jerrold’s “Black Eyed Susan” in 1829. A veritable hit, it ran for over 400 nights. Elliston died in 1831, and Osbaldistone followed as lessee. He, too, scored a success with a murder play “Jonathan Bradford”. On 19 November 1838 an unauthorised version of “Oliver Twist” was produced and Charles Dickens visited the theatre to see it. Alfred Bunn took over in 1847 and started producing opera, but south London was not ready for such works, and his venture soon failed. 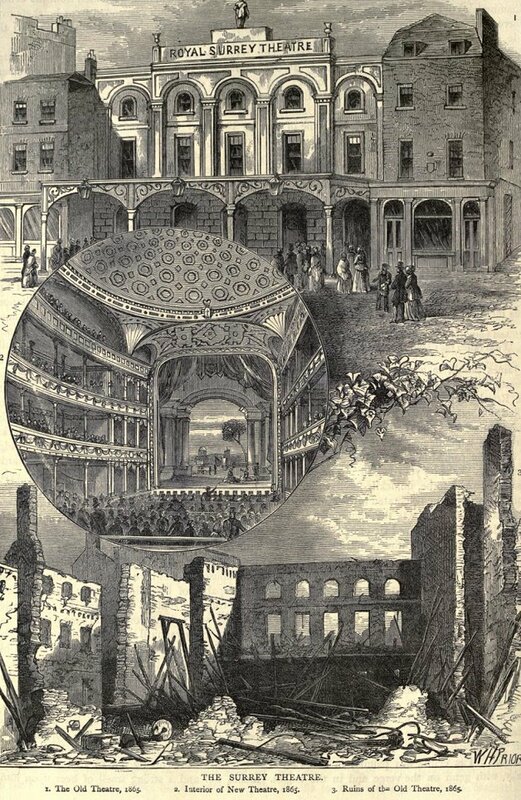 Richard Shepherd managed the theatre for the next two decades which saw yet another conflagration on 30 January 1865. By the end of the year a third building arose to open on Boxing Day. The architect was John Ellis, and the building cost £25,000. It had a capacity of 2161, plus standing which was distributed as 30 in the stalls, 600 in the pit, 176 in the dress circle, 264 in the boxes and over a thousand in the gallery. The stage was 70 feet wide by 60 feet deep. From August 1881 to 1901 the Surrey was run by George Conquest. During this period over 250 productions were staged, including pantomimes, in one of which Dan Leno made his first London appearance. In 1904 Kirk & Kirk converted it into a music hall. The Surrey was used as a cinema during the early 1920s but closed in 1924. It was demolished in 1934 and the site acquired by the Royal Eye Hospital.